Pros: The idea to investigate what the life of a minor character like Romeo and Juliet’s Rosaline looks like when she’s off stage makes for a compelling topic. Cons: The scenes, particularly the dialogues, are very long and there’s just really not a lot going on. A great central concept, but as a whole this play, despite excellent acting, doesn’t get off the ground. Theatre lovers, rejoice: you have an unparalleled range of plays about Romeo to choose from right now. While the traditionalists may content themselves with an old-fashioned ‘and Juliet’, those of a more adventurous spirit can head over to Shakespeare in Love to see the makings of the tragically doomed Romeo and Ethel the Pirate’s Daughter. And if you really like your classics with a twist, you can have a go at Fentiman’s Romeo and Rosaline. Romeo and Rosaline looks at the intriguing question of what happened to the other girl of Romeo’s dreams, the mysterious Rosaline who is never seen and only mentioned in the first act of Romeo and Juliet. Romeo has been writing Rosaline bad love poetry for months, letters to which she has never replied because she’s not really sure what to make of him. But then her parents decide that it’s time for Rosaline to get married, and Romeo starts to look like an attractive match after all. We all know how this is going to end . . .The set up calls to mind Tom Stoppard’s Rosencrantz and Guildenstern are Dead, in which Rosencrantz and Guildenstern, two minor characters from Hamlet, have long philosophical discussions while they’re waiting for their scenes in Shakespeare’s original play. The big difference however, is that Rosaline doesn’t have long philosophical discussions. In fact, she does very little at all, except waiting for a letter from her Romeo. While the idea of exploring what a minor character in a play is doing ‘in the wings’ is a compelling one, in order to make it work that character does need to have a life off stage. But since Rosaline’s entire existence seems to be hung up on Romeo, her life, sadly, is simply not that interesting to watch. The acting is excellent across the board; Felicity Jolly as Rosaline and Amanda Reed as the nurse stand out. 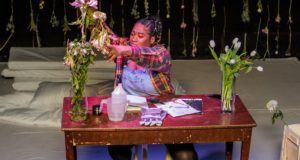 The staging is dynamic: set pieces are scattered throughout the Bread and Roses Theatre’s small auditorium, which keeps the actors moving around and between the spectators. 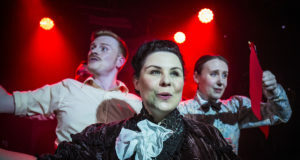 Unfortunately though, even the boatload of enthusiastic energy the cast brings to the stage is ultimately not enough to kick this play into gear. With some judicious trimming and a bit of a rethink this could be an excellent show; in this shape, however, it doesn’t evolve beyond an interesting premise.